Remember just a year or two ago when you had to pay $40 or $50 if you wanted a wireless charger that supported fast charging? Well those days are long gone. 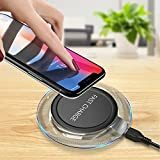 Amazon runs great sales on wireless chargers that support 7.5W fast wireless charging for iPhones and 10W fast wireless charging for Android devices like Samsung’s Galaxy phones, and we found one on Monday at the lowest price we’ve ever seen. The GETIHU Wireless Fast Charger is on sale today for just $5.99, making it a no-brainer. Like other low-cost models, it doesn’t ship with a wall adapter that supports fast charging, but there’s a pretty simple solution that doesn’t cost any money: Just use the fast charging wall adapter that came with your phone! 1.GETIHU Fast Wireless Charger: Enable you to charge the smartphones (support fast charging) up to 1.5x faster than traditional wireless chargers. With portable design allowing easy access to your phone while charging without the need for connecting your phone to a wall charger or USB port. 2.Two Charge Modes: Fast Charge Mode (Output 10W Max) is only available for Samsung Galaxy Note 5/S6 Edge Plus/S7/S7 Edge/S8/S8 Plus. Other Qi-enabled devices will charge at standard speed (Output 5W Max). 3.Sleep-friendly: User-friendly Designed Led indicator, No beep, No annoying lights. LED indicator will dim down automatically after working 10s and not interrupt your sleep. 4.Note: To enable fast wireless charging mode, Samsung original or QC 2.0/QC 3.0 adapter (not included) is required. The thicker or metal phone cases are suggested to be REMOVED while charging.